Preparations for my forthcoming trip to Ladakh include extended hikes through the glorious East Anglian countryside carrying a loaded backpack. For the trip, this notorious critic of low resolution audio files has upgraded to an iPod Classic 160GB to give virtually unlimited storage of low resolution audio files, and on the playlist* for my hikes are the six symphonies of Carl Nielsen. These are works I know well from the pioneering recordings by Olé Schmidt and the London Symphony Orchestra for the Unicorn-Kanchana label in the 1970s - one of my LPs from that cycle is seen above. But while listening to Nielsen's symphonies yet again, I have been struck by how they can open up the chink that allows us to fleetingly glimpse eternity, while ticking today's 'must have' box of accessibility. Yet, despite this, with the exception of the Fourth and Fifth symphonies, they remain comparative rarities in the concert hall and on the radio. Why there is so much Mahler and so little Nielsen is quite beyond me. In a typical example of the station's lazy audience whoring, between May 22 and 27 BBC Radio 3 broadcast three complete Mahler symphonies - including two broadcasts of the grossly overexposed First - and no Nielsen symphonies. Not only does Nielsen's opus offer a viable alternative to Mahler's, but I would go further and say that the six Nielsen symphonies are more consistent in quality than Mahler's nine and a bit. For those not familiar with all six, I strongly recommend the super-budget Nielsen cycle on Brilliant Classics with Theodore Kuchar conducting the Janáček Philharmonic Orchestra; about which I said in a 2009 post, buy or live in darkness. That mention of five Mahler-saturated days in May brings me to another composer who combines glimpses of the eternal with quotidian accessibility. Bohuslav Martinů's symphonies have also fallen victim to the same audience-whoring, and, needless to say, they also drew a blank on Radio 3 between May 22 and 27. So, to compensate, on my iPod is the cycle of Martinů symphonies recorded by the Royal Scottish National Orchestra under Bryden Thomson. These were recorded for Chandos in the 1980s when the orchestra was managed by my former EMI colleague Christopher Bishop. Today, Bryden Thomson is, like John Pritchard, a forgotten figure. But the power of Thomson's conducting of Martinů is on a level with the composer's creative vision, and that level is very high indeed. It is not a coincidence that Bryden Thomson was also a very fine Nielsen interpreter, and his Nielsen symphony cycle, also for Chandos, was the last thing he recorded before his untimely death in 1991. 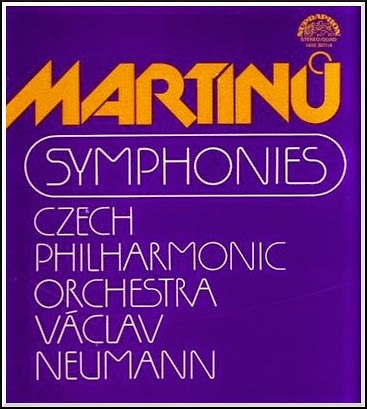 Below is the 4 LP box of the Martinů symphonies recorded by Václav Neumann and the Czech Philharmonic, that revealed to me the greatness of Martinů's music; this was recorded in the late 1970s by Supraphon in Eastern Europe while the Mahler bandwagon was gathering momentum in Western Europe and the US. Today, we live in a time of almost unlimited broadcast bandwidth, which, together with the low cost and huge capacity of digital storage, offers the possibility of almost infinite choice. So I should not be making the case for Mahler versus Nielsen and Martinů, because the potential is there to for us listen to and revel in all three composers. But that potential is being negated by the audience whoring of so-called industry experts. In a typically self-contradicting post, fellow blogger Norman Lebrecht accused star ratings in reviews of being the blight of classical music. Sadly, Norman has it wrong yet again. If the BBC really wants to know why the Radio 3 audience figures continues to nose dive it needs to ask two questions. Why Mahler? Why not Nielsen and Martinů and a host of other deserving and accessible composers? * My trusty Sennheiser PX 200 folding headphones are still going strong after twelve years hard use. But for up close and personal listening they have now been supplemented by AKG 451s. This is because the AKGs are closed back design which offers some masking of ambient noise in sonically hostile environments such as aircraft. I would have chosen the new Sennheiser PX 200-II closed back headphones, but these have a captive lead with an annnoyingly vulnerable in-line volume control, whereas the AKGs come with two detachable leads, one with and one without inline volume control. The AKG 451s offer more heft in the bass and lower mid-range, but, even after an extended burn period, lack the transparency of the Sennheisers in the upper-mid and higher frequencies. It is a trade off I can live with as I view portable audio devices as a sonic compromise, and I have a pair of Sennheiser 580s for studio monitor quality listening at home. All CDs, audio equipment and travel mentioned are paid for by me. Any copyrighted material is included as "fair use", for the purpose of critical analysis only, and will be removed at the request of copyright owner(s). Also on Facebook and Twitter.